Sushi Pack was one of the final shows produced by DiC Entertainment before it was folded into Cookie Jar Entertainment. Created by Studio Espinosa, developed by story editors Tom Ruegger and Nicholas Hollander, and produced in association with American Greetings, Sushi Pack starred a veritable bento box of sushi brought to life by strange lightning. Together, they became the defenders of Wharf City. Tako gets victory fives from Maguro, Wasabi, Ikura and Kani. 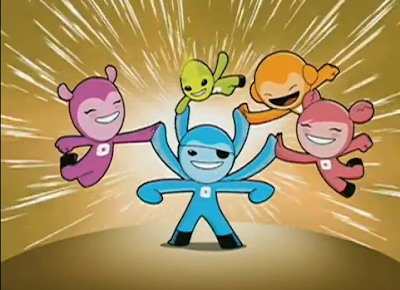 Tako Maki (Rick Adams) was a blue octopus and the leader of the Sushi Pack. He was able to extend his limbs and shoot mutli-colored ink, but preferred to use them in his painting rather than crime fighting. Maguro Maki (Tara Strong) was a purple esper tuna with psychic powers; including telepathy and telekinesis. She was centered and “in tune with her inner tuna,” and served as the team’s second-in-command. Ikura Maki (Andrew Francis) was an orange salmon egg with the ability to shoot sticky fish eggs from his hands. While usually calm, he gets the urge to compete with his teammates that often leads to tension amongst them. He also had a fear of all kinds of bears (even gummy), and a crush on Kani. Kani Maki (Chiara Zanni) was a pink crab whose claw-tipped pigtails were used to give foes powerful pinches. Living up to her type, she was often very “crabby.” Wasabi Pow (Scott McNeil) was a green wasabi and a spicy ball of hot mustard that could shoot fireballs. He was only able to communicate through squeaks that his teammates had no problems understanding. The Sushi Pack lived in an organic donut shop run by their human friend, Ben. Titanium Chef watches as Toro, Mochi, Fugu, Unagi and Uni enjoying their meal. The primary foes of the Pack were the Legion of Low Tide; similarly mutated food items who wanted to conquer the city. Their leader, Titanium Chef (Adam Behr) was a human-sized catfish that also ran the sushi bar his team lived in. He frequently got his plans and magical solutions from an ancient book. Toro (Vincent Tong) was a fat, dimwitted tuna who was incredibly gullible. Unagi was a hyper-observant electric eel who occasionally helped the Pack. Mochi Macchiato was a mochi ice cream with ice powers, and had been known to be friends with both Maguro and Kani. Fugu (McNeil) was a blowfish who could extremely increase his size and had an eye that functioned as a camera. Uni was a sea urchin with the ability to shape shift and a strong, tactical mind. Sushi Pack debuted on CBS on November 3, 2007 as part of their KEWLopolis programming block. KEWLopolis was the result of a partnership between CBS, DiC and American Greetings and was meant to be geared towards young female children. The series blended comedy and action, but put an emphasis on pro-social messages and the characters using their wits to defeat their over-the-top villains. Gilles Rudziak, Ana Dinis Tomas and Manu Perez designed the characters. Animation duties were handled by Suzhou Hong Yang Cartoon Co., Ltd. and the show’s music was composed by Phofo. Each episode was comprised of two short story segments. When Cookie Jar absorbed DiC, it took over production of the show’s second season. CBS renewed its time-lease agreement with Cookie Jar for an additional three years in 2009. On September 19, the block was rebranded as Cookie Jar TV and all of the block’s previous programming was dropped, with the exception of Strawberry Shortcake (2003). Merchandising for the show included plush dolls of the characters and a coloring book. In 2008, CBS Broadcasting released “Every Body is Some Body!” on DVD; the only DVD release to date. However, the first season was made available for streaming on Amazon. “But Is It Art? / Wassup Wasabi?” (11/3/07) – The Collector steals various paintings from the museum and brings them to life. / Wasabi runs away after he’s teased and joins the Legion of Low Tide where Titanium Chef copies him. “No Clowning Around / World’s Tastiest Heroes” (11/10/07) – Sir Darkly conjures up a storm by collecting the tears of the citizens. / An alien invader captures the superheroes from the Pack’s favorite TV show. “Go With the Glow / Poached Salmon” (11/17/07) – An argument between Maguro and Tako prevents them from stopping the Legion from causing a brown out. / Ikura’s impulsiveness gets the Pack caught in a trap set by Oleander. 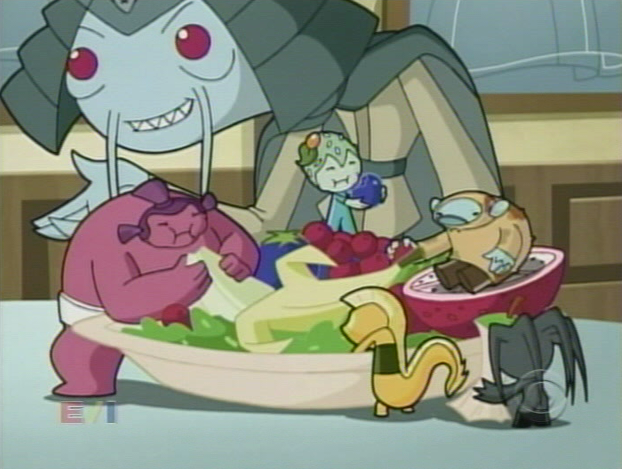 “Deep Freeze / Satel Lightning” (11/24/07) – The Pack and Legion are unhappy with the friendship between Maguro and Mochi Mochiato. / An asteroid hits a satellite and they mutate into a robot monster. 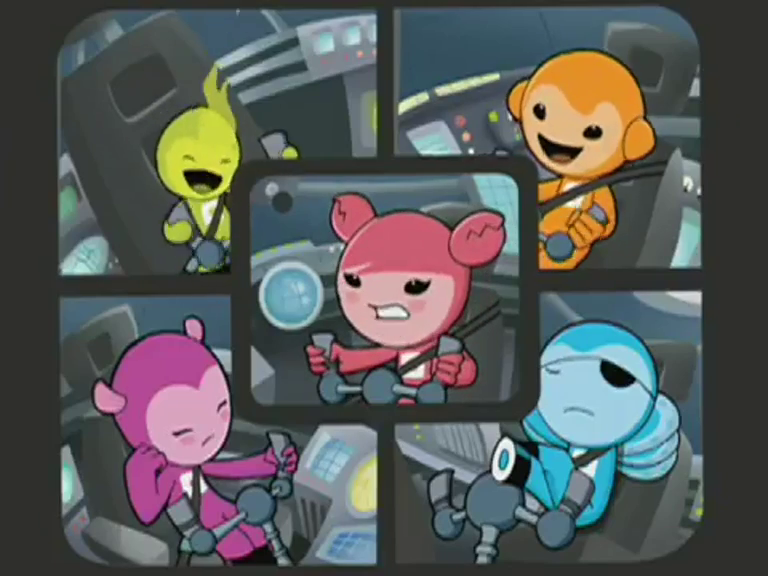 “Red Hot Chilli Planet / Sweet Tooth” (12/1/07) – The Pack has to prevent the Hot Squad from speeding up global warming. / Wasabi becomes addicted to candy and ends up overweight, leaving the Pack to get him back into shape. “Taming the Gaming / Rex Marks the Spot” (12/8/07) – Tako becomes addicted to video games. / Tako becomes jealous when Ben doesn’t give him a comic book ring and causes the Pack to lose a mission. “When Will Ben Be Zen? / Wharf City on the Half-Shell” (12/15/07) – Ben tries to prove himself to the Pack by keeping the shop open in the face of a poor health inspection. / A giant clam from space attacks the city. “Dough Ray Me / Sign of the Tuna” (12/22/07) – Ikura leaves on personal business as the Pack has to protect the city from mutant cookies. / Toro gets injured and Maguro decides to sideline him. “The Yam Yakkers / Dungeon of the Crab” (12/29/07) – Villains unite to form the Yam Yakkers, while Ikura and Wasabi want to see a new movie. / The Pack splits up to find a stolen pearl and end up trapped in a dungeon. “Deep Sea Diver Dude / Fish Tales” (2/2/08) – Tako wallows in self-pity over not having a family until he gets a mysterious invitation. / Wasabi overhears Kani and Ikura talking and misunderstands the conversation. “The Thing That Wasn’t There / Staring Ikura” (2/9/08) – The Pack doesn’t believe Maguro sees a monster attacking the city. / Ikura becomes the star of a hit television show and gains a massive ego. “Give Peas a Chance / Chemicals Made from Dirt” (2/16/08) – A big donut order has a stressed Ben take his frustrations out on Wasabi. / Titanium Chef’s new shoe cleaner makes everyone feel cold. “Says Who? Darkness and Spice” (2/23/08) – The Pack has to figure out who screwed up a mission: Tako or Maguro. / Wasabi’s fear of the dark interferes with the Pack’s ability to capture Uni. “Sushi Express / Ring-a-Ding-Ding” (9/13/08) – Ikura freaks out when his action figure ends up missing. / Kani struggles with what she should wear as ring bearer for the wedding of The Crowned Princess of Power and Fantastic Fellow. “Near Miss / Mirror Schmirror” (9/20/08) – Maguro gets jealous when Tako keeps getting all the credit for the team’s rescues by the populace. / Titanium Chef banishes the Pack into a mirror dimension where they are the villains. “Collect ‘Em All / Jigsaw Sushi” (9/27/08) – The Pack is excited by the release of new Aquabot toys. / Baron Von Loudly sets his sights on capturing the Pack. “Sushis of a Certain Stature / A Very Big Deal” (10/4/08) – The Pack gets jealous when Kato Platypus is honored with a statue, and then they have to rescue him from Apex. / Ikura is hit by a ray that turns him into a giant and its novelty wears off quickly for him. “Sushi vs. the Food-Fighting Force / Everybody is Somebody” (11/8/08) – Oleander creates her own team from deep-fried foods to destroy the Pack. / A magical dust causes Wasabi to switch bodies with the mayor. “Pants on Fire / The Wrong Sushi” (11/15/08) – Ikuri plays off getting new powers like the rest of the Pack in order to not feel left out. / Titanium Chef frames the Pack for kidnapping basketball player so that he can steal a trophy without their interference. “Respectable Delectables / Star of Light, Star So Bright” (11/22/08) – The Pack goes undercover to find out why their foes are gathering together in the same place. / After the Legion foils them by cutting out the lights, Tako decides the Pack must learn how to fight in darkness. “Ben’s Law / Where No Truth Lies” (11/29/08) – The Pack goes on a team-building boat trip while Sir Darkly plans to rob a fund-raising boat party. / The Pack has to deal with trust issues when Tako lies about the whereabouts for Maguro’s lucky charm. “Donut Whodunnit / Sushi at the Center of the Earth” (1/31/09) – The Pack find Ben gone and the shop a mess, and decide to hold a competition to see who can solve the mystery first. / The Pack investigates the sudden appearance of a volcano off the coast. “Disappearing Act / Wicked Waste Wisps” (2/7/09) – Sugar Jimmy brings cartoon characters to life to help him commit crimes. / Sir Darkley uses ghosts to brainwash people to litter. “From the Planet Citrus / Lights On, Lights Off” (2/14/09) – The Pack are chosen as delegates to greet visitors from the Planet Citrus. / To celebrate getting an award, the Mayor orders everyone in the city to run their hoses and turn on all their lights at the same time. “In Hot Water / Much Ado About Tako” (2/21/09) – The Pack is getting on each other’s nerves, reducing their effectiveness to save Satel-Lightning. / Tako decides all he needs is his extra arms to stop Titanium Chef’s latest scheme. “Sushi Roll Model / Fair Share, For Sure” (2/28/09) – After a reporter portrays them as bad role models, the Pack tries to change their image. / The Pack fights over a gift they purchased together.